I bought this rug for the dining area in my open concept home. I paired it with another large kilim rug (http://www.overstock.com/#/Home-Garden/Hand-woven-Wool-Jute-Rug-8-x-106/4588863/product.html) in my living room area. The colors include rust orange, teal blue, olive/forest green, with hints of burgundy red and navy/deep blue. The colors aren't shockingly bright, but softly faded like southwest style blanket. The rug is made of a wool/jute blend that vacuums off easily and looks well made. 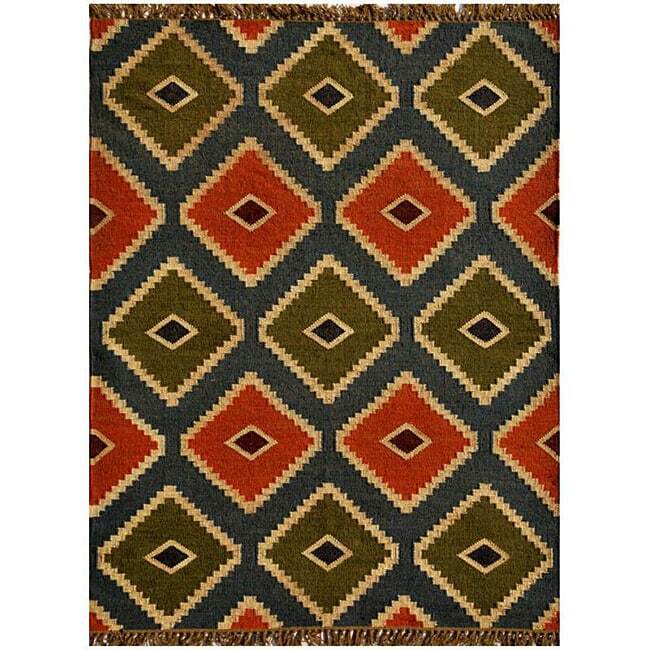 This bold Kilim area rug showcases a geometric design rendered in a vibrant color scheme. This rug is hand-woven with a wool and jute blend to ensure quality and beauty. I'm using this rug in my modern living room and I love it. I placed it on top of wall-to-wall carpeting, which is why I went with wool/jute (rugs with the rubber backing or thick piles would continually wrinkle on me). The color on the website is a shade or two darker than the rug actually is in person, but I still think the colors shown on Overstock are pretty accurate. Even though they are lighter, I would NOT say that the colors are muted. I love the statement this rug makes, and it is absolutely the best deal I found. I looked at rugs in target, walmart, tuesday mornings, and marshalls. This rug was the best price and the biggest size. It also met my needs in terms of no backing. My only complaint is the type of rug is very rustic and scratchy. there's a lot of Jute in this rug. Not what I wanted for a living room. the colors are much more muted than the photo and less defined. I wish I had the right room for this rug but unfortunately I had to send it back. beautiful rug and looks great on our light colored floors. The colors are slightly muted from the picture, which I was planning on based on other reviews! The color is somewhat more muted than in the picture (which I appreciate, it might have been a little bright otherwise). So far it seems relatively durable, although a rug tape hasn't worked very well with this rug and a rug pad would probably be better. I really like this rug and was so pleasantly surprised that the colors were even brighter (lighter) and bolder than the picture. Blue background with orange, olive green and a touch of dark lavender and maroon in the smaller diamond shapes. Perfect rug for my rustic family room. Great price too. I love this rug! It is thin and requires a non-slip mat underneath, but that was documented on the website. The colors are gorgeous--the design is so smart. I love this rug. It is well made, well designed, love the pattern and colors. I liked the pattern, but the colors are deceiving. The background is a faded blue, not grey. And some of the small diamonds are a faded red (pink-ish) and green. Love the pattern, but it's not a very thick rug (moves a lot) and fades quickly over time. I've had this for 3 years now and the colors aren't as rich anymore. "Is the rug 9 feet including or excluding the fringe?" Hello reb, the measurements include the fringes. All rug sizes are approximate. Thanks for shopping with us! 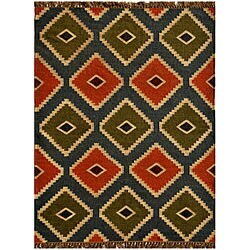 Hand-Knotted Amani Kilim Wool Area Rug - 3'6" x 5'6"